Two years ago, Janelle Ayres received a frantic text from her mother 12 hours after her father was discharged from the hospital. Ayres’ father, Robert Lamberton, had undergone routine gallbladder surgery and was supposed to be recovering at her parents’ home on the outskirts of Oakland. It was a common surgery and nothing was supposed to go wrong. But something was very wrong. Ayres knew from the symptoms her sister described on the phone that her father had sepsis, a poorly understood condition in which the body’s reaction to an infection is more deadly than the infection itself. She caught the first flight from San Diego to Oakland and rushed to the hospital where her father had been taken by ambulance. When she entered his room in the intensive care unit, her father smiled and gave her the thumbs up she’d seen a thousand times as a child. The doctors explained that the gallstones went undetected for too long, resulting in an infection in his gallbladder. The bacteria had spread to his bloodstream and taken hold in his spine. They confirmed he had sepsis. The only treatment option was administration of broad-spectrum antibiotics. Over the next several days, Ayres stayed in the hospital room with her father, obsessively watching his vital monitors. She was hoping the next blood pressure read would be higher or the next ventilator read would be lower, anything to suggest the antibiotics were working. All the while, her father watched endless reruns of Blue Bloods, a cop drama that he didn’t particularly like, but it was something to do. His numbers never got better, and as the days progressed, his conditioned worsened. The infection was antibiotic resistant, making the only treatment option available to him useless. Her father fought for nine days after he was readmitted to the hospital. But in the end, the bacteria won. 700,000 people die from antimicrobial-resistant infections worldwide. 23,000 people die from antibiotic-resistant infections in the United States. 2 million people are infected by antibiotic-resistant bacteria in the United States. Losing a parent is emotionally devastating, but for Ayres the ordeal also was surreal and frustrating. Surreal because Ayres, an associate professor at the Salk Institute and one of the world’s foremost experts on bacterial infections, watched a loved one succumb to the kind of infection she studies every day in the laboratory. Frustrating because in her research she had discovered a completely different approach to treating infections—an approach that likely would have saved his life. Her first breakthrough had come seven years earlier, when she was a graduate student at Stanford University School of Medicine. She earned her admission to graduate school and a prestigious research fellowship to fund her education through hard work—the only kind her father believed in. A German immigrant, after his service in the Navy and Vietnam, Lamberton went to aviation school and became a jet engine mechanic for National Airmotive Corporation and later Rolls Royce, both in Oakland. He had commuted more than two hours each day for his job and for as long as Ayres can remember, he worked seven days a week. He rarely took a sick day, and he raised his three daughters with that same work ethic. He pushed them to set goals and taught them that if they worked hard they could accomplish anything. He insisted that his daughters take after school jobs in high school so that they could learn the value of hard work and accountability. During high school Ayres served ice cream at Baskin-Robbins and worked at a grocery store. During her undergraduate years at the University of California, Berkeley, similar to her father, she commuted over two hours each day and she worked full time in a molecular cytogenetics laboratory at Lawrence Livermore National Laboratory. The schedule was demanding and tiring, but she graduated with her bachelor’s degree and a 4.0 grade point average—a goal she had set when she started college. While at Berkeley, Ayres attended a seminar on infectious diseases that inspired her to devote her career to combating the global health crisis of infectious diseases and drug resistance. 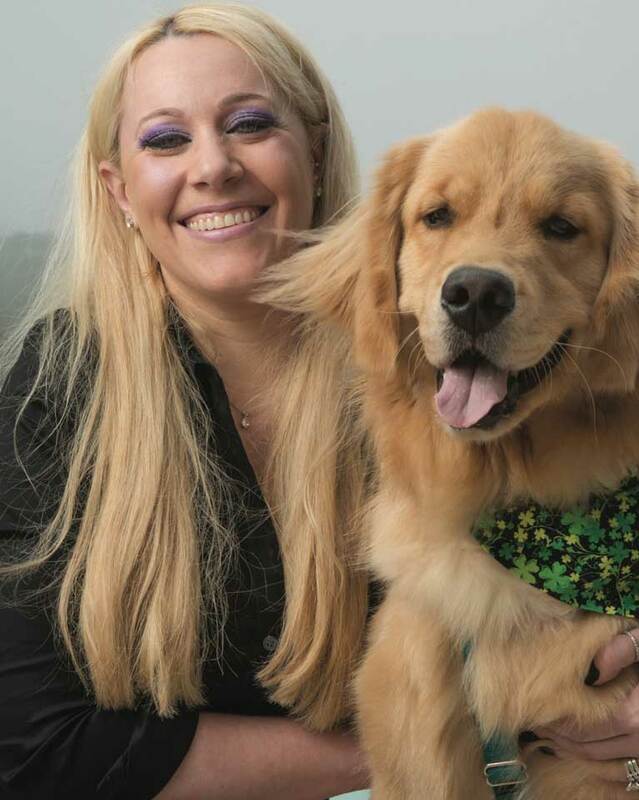 To pursue her goal, she entered the microbiology and immunology doctorate program at Stanford University, working with David Schneider, a world-renowned immunologist and infectious disease researcher. As part of her research in Schneider’s lab, Ayres studied how fruit flies respond to bacterial infections, searching for clues in the flies’ DNA to the biological interactions between a host and pathogen. In a breakthrough experiment, Ayres dosed a group of flies with Listeria bacteria, a food-borne microbe that causes a potentially deadly infection in humans known as listeriosis. She found that some of the infected flies were more resilient than others, showing fewer symptoms of disease and better chances of survival. What was surprising was that the flies’ chances were unrelated to the level of infection in their bodies. Of two flies with the same degree of infection, one might die while the other survived. It might not sound like a dramatic result, but it challenged one of the pillars of immunology dogma: that survival during an infection depends entirely on how effective the immune system is at killing the offending pathogen. Ayres’ experiments showed that flies with similar immune responses had very different outcomes. She realized that something other than the immune system was kicking in during the infections, something that focused not on killing an invading pathogen but on saving the host’s life. She gave this phenomenon a name: tolerance defense system. The implications were profound and heretical. Since the dawn of the field of immunology, the reigning mantra has been that the best defense is a good offense. The predominant metaphor has been war and the goal was the eradication of the pathogen—the enemy. It served humanity well—for a while. The first effective way of dealing with pathogens was soap, a low-tech (and still very effective) tool for killing microbes. Nowadays, we expect doctors and nurses to wash their hands, but the modern concept of medical hygiene didn’t really exist until the mid-1800s, when an Austrian obstetrician named Ignaz Semmelweis began advocating for doctors to scrub before delivering babies. As a result, far fewer women died from infections contracted during childbirth. Later, in the early 1900s, the German scientist Paul Ehrlich popularized the idea of a “magic bullet” drug that would target a specific bacterial infection but not harm patients. The first such drug was discovered in 1928 by Scottish scientist Alexander Fleming, who found penicillin in a moldy laboratory dish. Since then, more than a hundred antibiotics have been developed and those drugs have saved hundreds of millions of lives. The early generation antibiotics were so effective that many health officials declared infectious diseases would soon become a worry of the past. But the enemy is wily. Over time bacteria evolve resistance to drugs, an ability largely overlooked in the early exuberance for magic bullets. Overuse and misuse of antibiotics have created a global health crisis. Every year in the United States alone, 2 million people are infected by antibiotic-resistant bacteria. Of those, at least 23,000 die from the infections. Worldwide, approximately 700,000 people succumb every year to antimicrobial-resistant infections. As tragic stories and urgent warnings spread, superbugs can seem like fearsome monsters sprung from out of nowhere, but in truth they are of humanity’s own making. And fearsome as they are, we keep feeding them. Every year, the problem gets worse, driven by overuse of antibiotics in humans and livestock that puts intense evolutionary pressure on bacteria to develop resistance to the drugs. As a result, the more we use antibiotics, the less useful they are. Highlighting the urgency of the situation, the World Health Organization (WHO) recently published medicine’s equivalent of the FBI’s Most Wanted List, naming a dozen superbugs that pose the greatest threat to human health. At the top of the list are microbes that present a particular risk in hospitals, including Acinetobacter, Pseudomonas and various bacteria that live in the gut, such as Klebsiella, Serratia, Proteus and E. coli, the type that took Robert Lamberton’s life. The WHO announcement warned of the decline in the development of new antibiotics. Compared to other classes of drugs, antibiotics are far less profitable for drug makers because they are only used for short periods of time—during an infection—and their clinical effectiveness ends when bacteria evolve resistance. Many pharmaceutical companies have moved away from antibiotic research in favor of more profitable drugs used for chronic illnesses, such as antidepressants, targeted cancer therapies, anti-inflammatories and drugs for high blood pressure and cholesterol. Ironically, in many cases, patients suffering from these chronic diseases have weakened immune systems and part of their treatment regimen is antibiotics. In releasing their list, the WHO officials were sounding an alarm that humanity is approaching a dangerous superbug-filled chasm at a time when the pipeline for new antibiotics is running dry. The war cry is clear: We need more weapons! And yet, from Ayres’ perspective, this “arms race” mentality has limits that have been laid bare by history and the superbug epidemic. The current crisis has its roots in the early days of infectious disease medicine and its myopic focus on fighting with microbes. Her research points to another way of thinking about disease—one that focuses less on killing bacteria and more on helping patients survive. It offers the potential to develop drugs that promote survival of patients without driving drug resistance in pathogens. 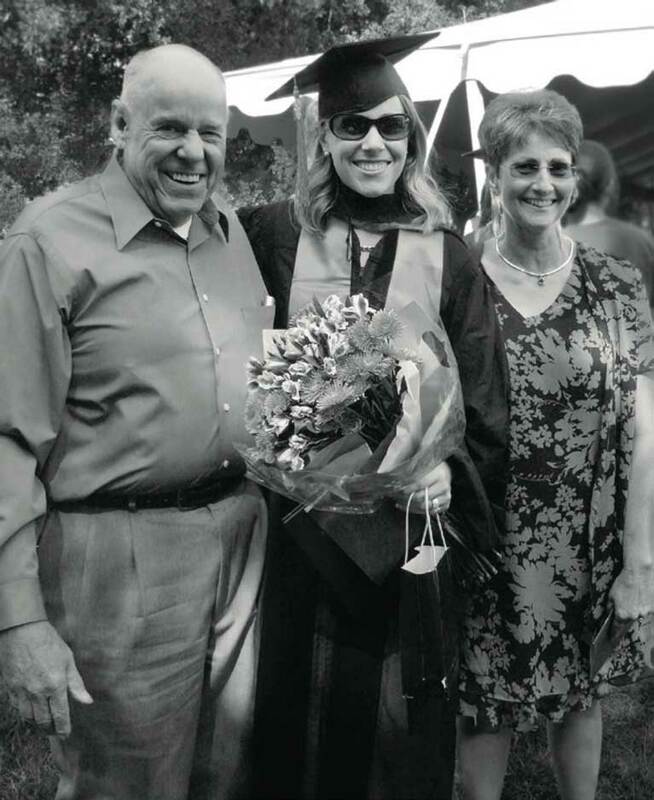 Janelle Ayres, pictured with her father, Robert Lamberton, and her mother, Frankie Lamberton, at her 2008 commencement at the Stanford School of Medicine. 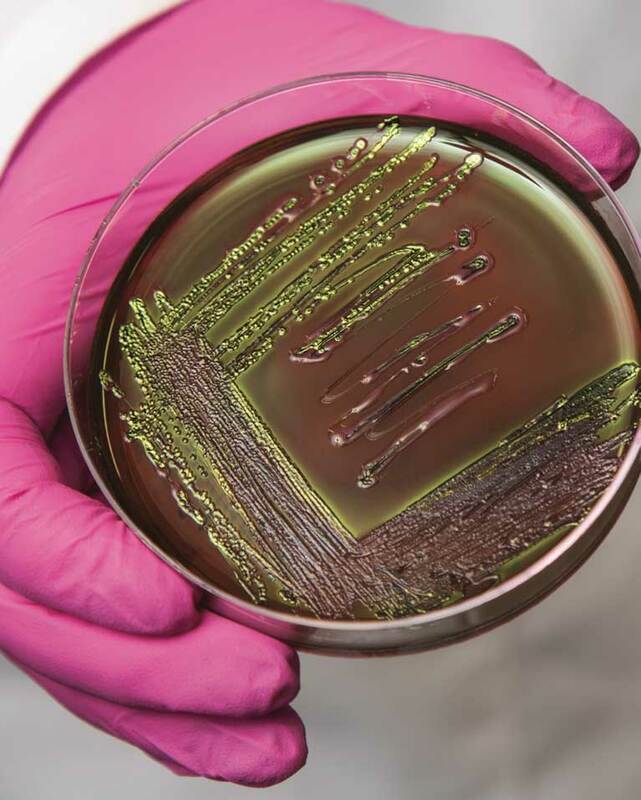 Ayres’ team discovered that this strain of E. coli bacteria (shown growing in a lab dish) helped mice tolerate dangerous infections. Ayres with her dog, Hans Ferdinand, whom she named after her late father (using his German name). When Ayres joined the Salk Institute in 2013, she was intent on finding out more about the mysterious survival skills she’d discovered in fruit flies while at Stanford. She built her Salk laboratory to focus on exploring the same phenomena in mice, fellow mammals that offer more insight into human infectious disease biology. Repeating her fruit fly experiments in mice, she found that rodents appear to have a similar tolerance defense system in place. By extension, we humans very likely have such a system at work in our bodies. And, in fact, evidence for this comes from the examination of a variety of human infectious disease cases. Take Mary Mallon, an Irish immigrant to the United States in 1883, known to history by the infamous moniker a prominent medical journal gave her: Typhoid Mary. Mallon was a cook who worked for several families and public kitchens in New York in the early 1900s. She also was an asymptomatic carrier of Salmonella Typhi, the bacterium that causes typhoid fever. She showed no symptoms of the disease, yet was a “super shedder” who left a trail of typhoid outbreaks and deaths as she moved from kitchen to kitchen. Mallon was convinced she was being unfairly persecuted when health officials asked her to stop cooking—she even refused their pleas to at least wash her hands before handling food. Exasperated, authorities arrested and quarantined her for three years, releasing her only after she promised not to work as a cook. She stuck to the bargain for a while, but then changed her name to Mary Brown and went back to concocting her deadly dishes. Eventually, as a public safety measure, she was found and forcibly quarantined on a small island in New York’s East River for the remainder of her life. Estimates hold that prior to her incarceration, at least 50 people were infected and three people died from eating her tainted fare. Like Ayres’ infection-tolerant flies, Mallon and other asymptomatic carriers of infections provide evidence that our bodily relationship to microbes is not as simple as kill-or-be-killed. Mallon breezed along with trillions of S. Typhi in her body while some of her customers dropped like flies. Another clue that our relationship with bacteria isn’t solely adversarial is our microbiome, the community of beneficial bacteria living in and on our bodies, mostly in our intestinal tract. Our bodies contain more than 9 trillion bacteria, about 10 times as many bacteria as human cells, and this community of microbes collectively weighs about 3 pounds—as heavy as our brain. There is much evidence that we have coevolved a symbiotic relationship with our microbial passengers. Among other things, they make enzymes essential for helping us digest food, they generate molecules that help our cells function correctly and they are essential for maturation of our immune system. Ayres suspected this relationship goes much further and that our microbiome might play a central role in the tolerance defense system she discovered. If the microbiome was in fact key to infection tolerance, she hypothesized, the composition of a person’s microbiome would help determine their ability to tolerate an infection. To test this, she collected mice from labs around the country. The mice were genetically identical, but carried microbiome communities specific to their geographic origins. A mouse from Long Island, New York, had a different array of bacteria, for instance, than one from Northern California. In her Salk laboratory, Ayres and her team studied how mice from different locations responded to intestinal infections of Salmonella Typhimurium (a relative of Salmonella Typhi) and pneumonia caused by the bacteria Burkholderia thailandensis. They discovered that one population of mice showed no signs of muscle wasting, one of the most dangerous symptoms of serious infections. These resilient mice didn’t have a genetic advantage—all the populations were genetically identical—nor did they have stronger immune systems. All signs were pointing to a superior tolerance defense system. By comparing the makeup of the intestinal microbiome of the different populations of mice, Ayres’ team identified a strain of E. coli that was present only in the more resilient mice. But was this strain of E. coli really the superhero bug in the story? To test this, they gave mice lacking the strain an oral treatment of the beneficial E. coli and observed what happened when they were sick. Sure enough, the mice gained the ability to maintain their muscle and fat mass during infections. This was the first direct evidence that a specific bacteria from the microbiome could help an organism endure a pathogen by promoting the tolerance defense system. Ayres and her team pushed on in their experiments and found that in response to the infection, the E. coli was leaving the gut and moving into the animal’s fat deposits. There it was activating metabolic switches that communicated with the muscles, nourishing them to prevent wasting. Not only was a bacterium maneuvering in the body to bolster its defenses, it was activating genetic pathways that might well be part of the tolerance defense system. The implications were profound. The discovery demonstrated the possibility of entirely new classes of therapies. Superhero bacteria such as Ayres’ E. coli might be used as therapies to help patients tolerate infections—microbes as medicine. New types of drugs could focus on promoting a patient’s health, raising their chances of surviving infections. Unlike antibiotics, such drugs wouldn’t target pathogens and so wouldn’t drive the evolution of drug resistance. This could spell the end of our arms race with pathogens. Tolerance- enhancing drugs could be used for treating other diseases such as cancers and inflammatory conditions that cause similar pathologies in the body as infectious diseases. Muscle wasting, for example, also occurs in response to tumors and chemotherapy. In that vein, Ayres and her team showed that their tolerance-promoting E. coli can block muscle wasting caused by inflammatory bowel disease. They are now testing this approach in preclinical cancer models to determine the spectrum of diseases in which this beneficial microbe can promote tolerance. Ayres’ research offers a ray of hope that is desperately needed. The 20th century, thanks to rapid advances in medical hygiene, vaccinations and antibiotics, was marked by a seemingly inexorable march of progress in the fight against infectious disease. In the 21st century, the battle has tilted against us. Our medical advances have created monsters that grow more lethal the more we fight them. A Masterful DesignMaintaining the Salk Institute’s iconic architectural vision. Inside the Mind of Ted WaittWhether it’s vital funding, imaginative technology or the perspective of a successful CEO, new Board Chair Ted Waitt says adding a little magic in the right place enables great discoveries. Surviving SuperbugsWe’re losing the war with infectious diseases. Ending the arms race with infectious diseases could mean learning to live with them.